Ropeloft are a well known UK company regarded as offering outstanding quality, with a good detail for knowledge. Their online business is able to minimise operational costs and bring inexpensive products such as 3-strand nylon rope to their sailing customers at exceptional value. Ropeloft stock all your sailing rope and cord requirements, whether you are looking for rope for tacking, gybing, reefing, hoisting, lowering, blowing, tweaking, sheeting, easing, dumping, tensioning, mooring, towing, pulling, rigging, knotting, splicing, kiting, sailing or boating. Joe Taylor , the proprietor, being a boat owner himself, aims to provide the right product at the best possible price. 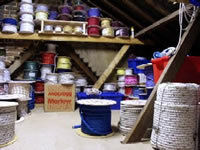 Their extensive high quality range of rope includes.